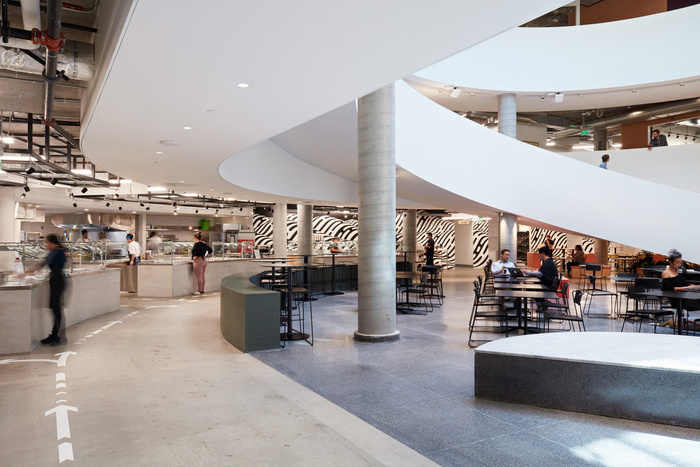 Airbnb‘s in-house architecture practice of ten, the Airbnb Environments Team, has designed their new headquarters expansion in collaboration with WRNS Studio, located in San Francisco, CA. 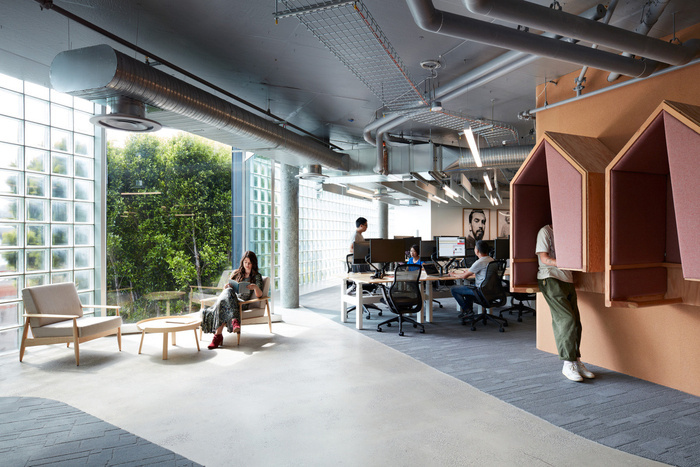 Airbnb is delighted to unveil 999 Brannan, a new office in San Francisco designed by Airbnb’s Environments Team with local architecture studio WRNS as architecture firm of record. The new space will form part of Airbnb’s US Headquarters alongside 888 Brannan. This is the largest single project that the Environments Team has developed. They were able to strip the space down to its bare bones removing every non-structural element of the building, fundamentally changing the experience, circulation and material palette of the interior. The challenge with this project was not to reinvent but instead to reveal the essential qualities of the building by emphasizing and articulating its core framework. The resulting design breaks free from the previous layout which blocked out all natural light. The new design focuses on harnessing light from the original glass structure. 999 Brannan’s design reflects Airbnb’s ‘Belong Anywhere’ ethos by incorporating elements of its global community into the design of the space. To do so the Environments Team looked to Airbnb Trips as an organizing principle, a completely new concept for Airbnb’s office design. Launched in November 2016 Airbnb Trips allows users to book bespoke experiences designed and led by local insiders. The Environments Team translated this new feature into a physical space by assigning each floor to a different city: Buenos Aires, Kyoto, Jaipur and Amsterdam, styling each one of the floor’s cafes in relation to that city, the color, patterns and materials reflecting the local culture. Additionally the interior design of each meeting room is inspired by existing Airbnb listings around the world to enable employees to travel throughout their day. Led by Aaron Taylor Harvey and Rachael Harvey, the team worked in collaboration with WRNS to implement the Airbnb neighborhood concept and components into the space. Primary work spaces are divided into 16 neighborhoods with identical components, for up to 50 people each. Every neighborhood comprises of a desk space with large custom made communal tables and standing desks, three phone rooms, personal storage and a 15 to 30 person garage; a meeting room that can be adapted according to necessities by opening and closing a room divider with a garage door mechanism. 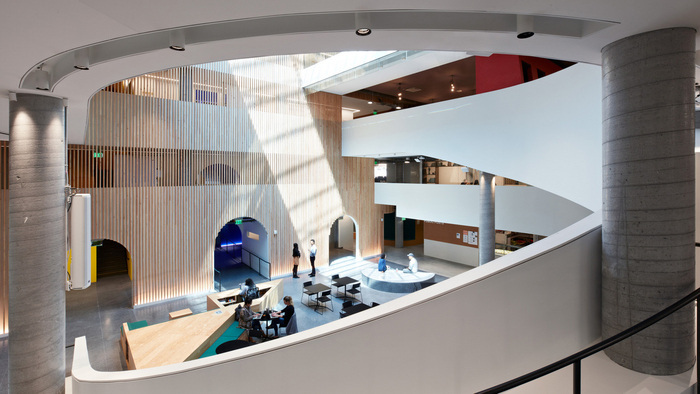 Other areas include: The Castle, made of pinewood strips at the centre of the building dramatizing the verticality of the atrium and the connectivity between floors. 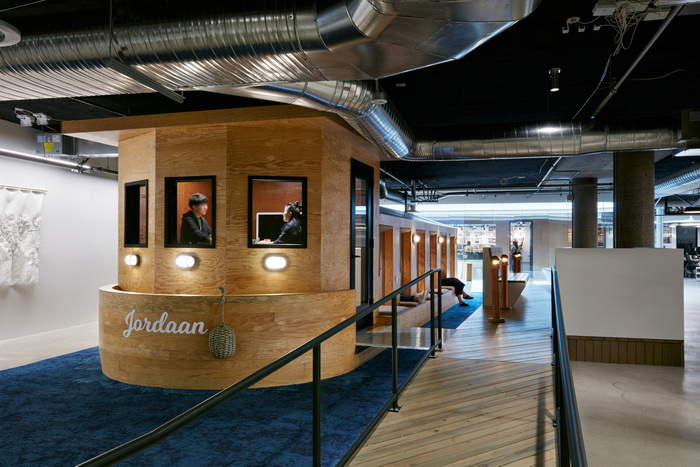 Above this sits The Boat, a highly functional office object offering on-demand privacy. 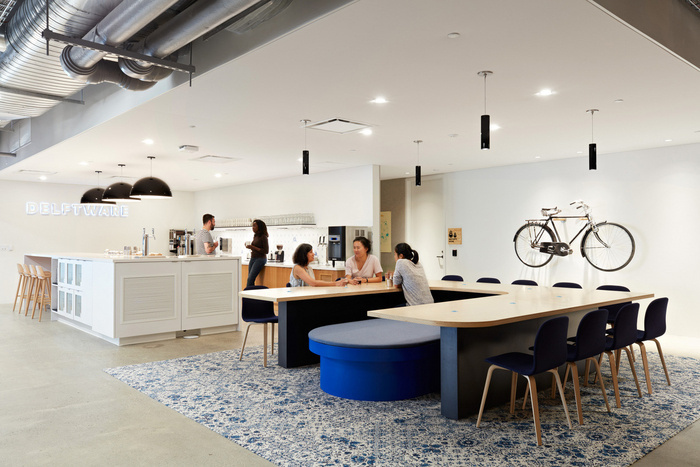 As part of Airbnb’s ongoing global office design strategy, The Environments Team engaged with local employees in an Employee Design Experience (EDX) program to help add the finishing touches to the design of the meeting rooms. 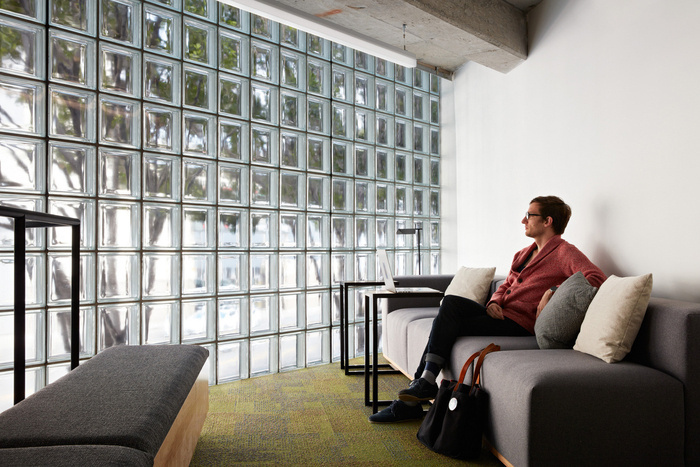 The EDX program enabled employees to re-interpret design components from Airbnb listings into the meeting rooms as well as illustrate elements of San Francisco’s local identity. One of the many inspirations for the meeting rooms was Solnechnogorsk, Russia: a cabin in the woods that is the perfect Moscow get-away. The cabin has pine clad walls with tapestries, pillows, books and games to keep you cosy while inside, and is surrounded by the forest and nearby ponds for outside activity. The EDX team sourced items from little Russia in San Francisco and New York to bring in fun prints (lots of Christmas cats) and character into the pillows and smaller accessories, as well as a local used-decorative iron stove that stands in the corner. The variety of work configurations within neighborhoods and secondary works spaces encourages healthy ergonomic movement, increased socializing and engagement. The Environments Team listened to the employee’s suggestions and following these discussions incorporated additional spaces in the building including a boot camp space, yoga room/wellness center with a Zen Japanese theme and an “apothecary” of wellness related items. 999 Brannan, the new 14,000 sqm office in San Francisco, houses over 1000 staff, covering a range of teams from customer service to legal departments. The previous office at 888 Brannan continues to operate.